EasyIron® E.G. (extra gentle) is formulated for those who are sensitive to iron supplements and contains 9mg of iron. Iron is a key nutrient that your body needs to make hemoglobin - a protein in your red blood cells that carries oxygen from your lungs to the rest of your body. An iron deficiency can result in fatigue, irritability, paleness and difficulty concentrating. Offering support for your energy levels, EasyIron® E.G. (extra gentle) is formulated for those who are extremely sensitive to iron, especially those with a history of irregular bowel movements. It contains half the amount of iron (9mg) combined with all the beneficial co-factors. Why does EasyIron® E.G. work so well? A Better Form of Iron - Recent clinical studies indicate that ferrous bisglycinate, the form of iron found in EasyIron® E.G., is absorbed significantly better than regular iron - as much as 4.5 times better, in fact. Unlike some other forms of iron, ferrous bisglycinate was demonstrated to be well absorbed even when taken with a meal. The body requires more than just iron to make healthy red blood cells. The combination of key nutrients found in EasyIron® E.G. was formulated to deliver optimal results. Many people find prescription or regular forms of iron constipating. EasyIron® E.G. contains ferrous bisglycinate, a form of iron that has been demonstrated in clinical trials to be well tolerated, with a low incidence of constipation and stomach upset. Recommended Adult Dosage: Take one capsule daily. Non-Medicinal Ingredients: Cold pressed olive oil, soy lecithin, beeswax. 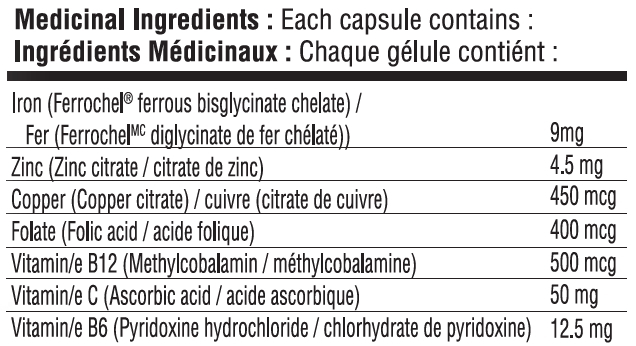 Capsule Ingredients: Hypromellose (from wood pulp), purified water. Caution: Keep out of reach of children. This bottle contains enough iron to seriously harm a child. Only time will tell, but so far no side effects and I'm feeling a bit more energetic. Well Hello ladies, LOL!! I'm iron deficient (hemoglobin & iron count) as per my blood testing this last fall. I started with a floradix liquid bottle a few months ago, then switched to the regular strength easy iron for one bottle. Both worked well. my MD is very concerned I will OD on iron, as I'm a male, and have no internal bleeding. To ensure I don't OD, I've switched to this extra gentle formula, 1/2 the dosage. I like the fact it also gives me zinc & copper in good quantity & ratio. I have had no constipation or other issues with this pill, take one per day, about 5 per week. MD has been fired, will follow up with a ND for further iron blood testing, and he can prescribe the dosage for me, but I suspect it won't change much. The best iron supplement for those with sensitivities. I am a vegetarian with acid/reflux & IBS sensitivities and wanted to supplement with a low dose iron tablet. 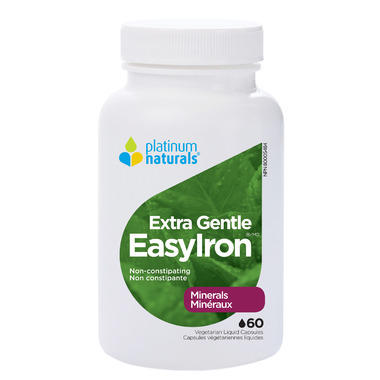 I have had no issue whatsoever with this iron supplement - it is highly absorbable and I notice how much better I feel on the extra gentle iron from Platinum Naturals. Highly recommend! Not constipation and keeps my anemia at bay! I have being using this product for a few years now, its the only one that I have found that does not upset my stomach at all.